The DP1 Desk Phone is an exciting new business phone that lets you make the most of your Ooma Office phone service. With feature-rich functionality and wireless connectivity, the DP1 provides you with a new way to stay connected. 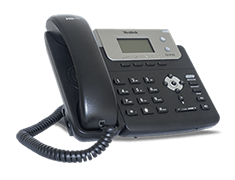 “The DP1 provides all the features of a high-end desk phone, yet can go anywhere there’s an electrical outlet, without having to worry about adding a phone jack or running phone wire across the room. There’s no longer any need to choose between flexibility and functionality in phones – now you can have both,” said Dennis Peng, VP of Product Management at Ooma. The Ooma DP1 Desk Phone uses DECT to pair wirelessly with the Ooma Office base station, which means that an electrical outlet is all you need to set up the telephone. Because of this wireless connectivity, businesses have the flexibility of installing phones where they’re needed, not where the wiring makes it convenient. For example, a business’ front desk area needs a full-capacity business phone, but the building’s phone wiring may not accommodate your preferred layout. Similar situations can occur in an auto shop, restaurant, or manufacturing company, where the business’ floor plan requires flexible placement of your phone service. Additionally, flexible phone tools are advantageous to businesses with high-volume calling, such as during phone drives at a nonprofit organization, or in situations like a rehabbed building where the former industrial space wasn’t intended for its current set of cubicles. Is the DP1 Phone Right for Your Business? If you’ve previously used an Ooma Linx to add wireless connectivity to your base station, the DP1 provides another option. Instead of plugging your analog phone into the Linx, which connects wirelessly, the wireless connection happens directly from the DP1 phone. The DP1 Desk Phone has a range up to 150 ft. from the Ooma Office base station. To put that in context, you can place the phone about 19 parking spaces away. Additionally, some features are easy to access via dedicated phone keys. For example, to transfer a caller to another extension, simply press the TRANSFER button followed by the extension number. Not only does this robust communications tool make business phone communications convenient, but it also helps you make the most of your Ooma Office phone service and increases your ROI. 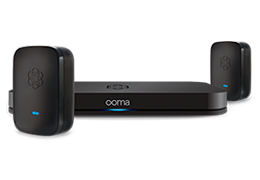 Wireless: The DP1 uses DECT 6.0 to connect wirelessly to the Ooma Office Base Station. No regular phone wires, ethernet cabling, or extra adapters are necessary. Keep in mind that each Ooma Office Base Station can support up to four DECT devices, including DP1 phones and Linx adapters. Feature-rich: Users have access to a bank of 32 programmable speed dial keys and dedicated buttons for advanced calling features. For example, call transfer, call hold, and call conferencing are available with one-button access. Comprehensive: The two-line phone provides the tools needed for an efficient business. Functions include redial, call logs, and a message waiting indicator. Better conversations: The DP1’s unique call conferencing feature lets you easily combine separate calls on two lines into one three-way conference call. Audio options: With the DP1, you’re not limited to using the phone’s handset. The speakerphone and headset functions give you the choice to have phone calls in a way that works best for you. Battery backup: The rechargeable back-up battery can power the DP1 for 24+ hours when in standby mode or for 7 hours of talk time, helping you stay connected even if you lose power. Make the most of your Ooma Office service: Ooma Office comes with features such as a virtual receptionist, after-hours mode, a free calling app, and music on hold. In addition, Do Not Disturb mode, 1-step blind transfer, and 2-step supervised transfer are all accessible with the DP1. Ahead of the curve: The DP1 is the first Ooma-branded phone that’s available for Ooma Office users, and it will be able to access Ooma’s forthcoming “call flip” feature, scheduled to be announced soon. Easy installation: Simply visit the Ooma Office Manager portal (office.ooma.com/base_stations) to pair the Ooma DP1 phone and assign it to an existing or new user extension. The Ooma DP1 Desk Phone is affordably priced at $89 USD, and Ooma Office customers can shop for the device via the Ooma Office Manager portal. Learn more about Ooma Office’s award-winning VoIP phone service, or log in to your Ooma account to purchase the Ooma DP1 Desk Phone for your business.